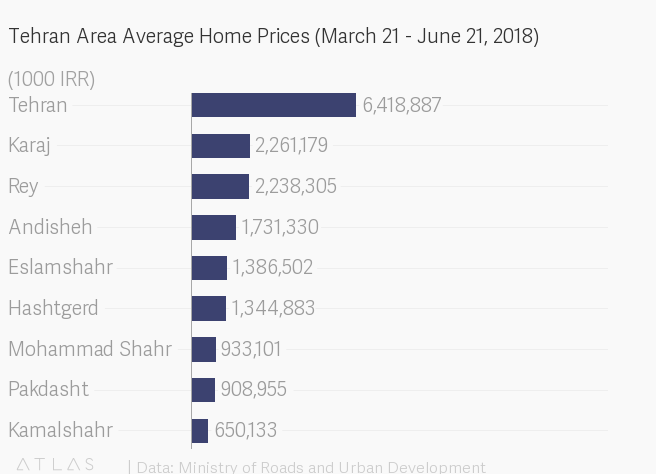 A 41 percent rise in Tehran City’s average home prices has left some residents, especially renters, with no option but to leave the capital for more affordable housing units in suburban areas close to Tehran. Figures released by the Ministry of Roads and Urban Development show that 37,700 housing units were sold in Tehran city during the first quarter of the current Iranian fiscal year (March 21-June 21, 2018) at an average price of IRR 70 million per square meter. A year-on-year comparison indicates 6 percent and 41 percent increases in total number of home deals and the average prices, respectively. The rental market has also experienced a surge in recent months. No public statistics are yet available about current year rentals in Tehran. However, Hessam Oqbaei, the deputy director of the Iranian Realtors Association, reported in a recent interview a 51 percent increase in Tehran’s rental price index in the past few months. This is while the Central Bank of Iran reported 12.5 percent growth in rental index of urban areas across the country during the third month of Iranian year. Monthly data released by Tehran Realtors’ Association also indicates a sharp 22 percent drop in number of rental contracts in the city during the month to June 21—the number is down from 22,143 last year to 17,200 this year. As per the latest national census conducted by Statistical Center of Iran in 2016-17, Karaj was the top destination for residents moving out of Tehran during the five years to December 2017. In just the last three months, more than 53,000 individuals have moved from Tehran to Karaj City. In the first quarter of the Iranian fiscal year, the Karaj housing market recorded 65 percent growth in home sales and an 18 percent increase in the average price of residential units. New housing developments and easier transport links, including expanded highways and suburban rail connected to Tehran’s subway network, have attracted homebuyers to the city. Following Karaj, several less expensive areas also saw increased market activity. Pakdasht in the south-east of Tehran Province and Andisheh, located south of Tehran City, recorded significant growth in home deals in the first quarter—75 percent and 56 percent, respectively. Homebuyers paid an average of IRR 900 million in Pakdasht and IRR 1.73 billion in Andisheh City, which is closer to the capital. By comparison, the average price of sold residential units in Tehran stood at IRR 6.5 billion in the same period. The same trend can be observed in Kamal Shahr and Mohammad Shahr, which saw the highest number of home deals in Alborz Province after Karaj. More than 1,178 deals were recorded by realtors in Kamalshahr at an average price of IRR 650 million. Homebuyers are not the only players in Iran’s real estate market. Choas in parallel markets such as the currency market, rising inflation, and low returns on bank deposits, have spurred speculative activities in the housing market. Speculation in smaller towns remains risky, as sudden increases in home prices could reduce the attractiveness of the suburban markets. The government is also taking various measures to help real homebuyers in the face of speculation—this has been on top of the Ministry for Roads and Urban Development’s agenda since President Hassan Rouhani took office. In a recent interview, the deputy minister of roads and urban development, Hamed Mazaherian, cautioned speculators over their presence in the housing market and recommended they exit the market before they bear losses. “The ministry will soon start addressing speculation in the market by levying taxes on vacant housing units and lands…Lawmakers are also studying a bill to levy tax on revenues earned from home sales,” he declared. The bill proposes levying taxes equal to 80 percent of the difference between the value of residential units at the time of purchase or sale. However, an exemption is considered for deals in which the owner sells the residential unit at a lower price than the money they paid at the time of purchasing it. More than 490,000 residential units are left vacant in Tehran City, according to roads minister Abbas Akhoundi. The Ministry of Economic Affairs and Finance has also said it strongly supports the measure, for it helps balance the housing market. In a futher move, the ministry is also considering a series of measures to support renters. According to Mazaherian, a bill has been proposed in parliament, which suggests increasing the minimum period of rent contracts from one year to two years or more.The proposed measure also includes setting a 10 percent cap for rent increases. Sepehr Arefmanesh is a business and economy journalist based in Tehran. Follow him at @sepehrate.